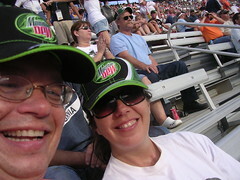 Sharon and I went to Bristol on Saturday for the big night race. We wore our Earnhardt caps and brought our scanner with headphones to the track. 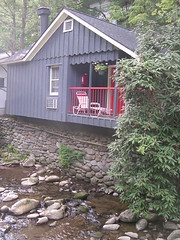 After the race we spent the night in a cabin in Gatlinburg. 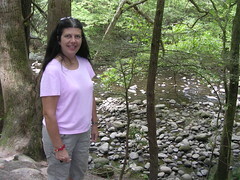 Early Sunday afternoon we did some hiking in the mountains and later she enjoyed shopping downtown and at the outlet mall. Though that was not my favorite part of the trip, I did enjoy checking out the Bose outlet store and hearing their incredible audio equipment. 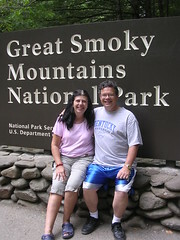 I don't think those blue shorts went over well in the smokies! Are you sure that is not Michelle in that picture? Yes, Sharon does have nice legs!